The Stitch and Seam started in 2012 to feature cosplayers and their skills. It has expanded to further explore topics on this community of nerds and crafters who enjoy sharing their favorite fandoms. 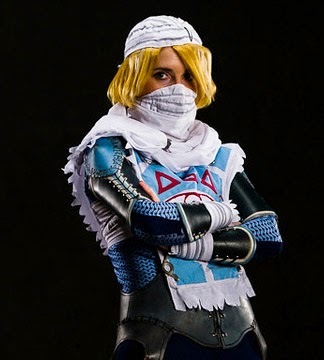 VFire cosplaying Sheik: Super Smash Bros version. Vermilion Fire, also goes by Mercedes, is always looking to level up her skills in just about anything. She carves wood into swords and shields, makes PVC pipe bows, leather-crafts armor, metal works details, and more. She has won many craftsmanship and performance awards across the Western United States and judged at various conventions and events. 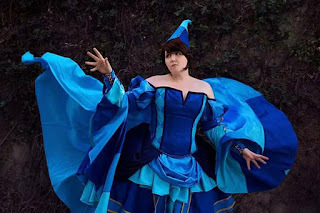 VFire founded the Cosplay Stitch and Seam Podcast and Blog to share her love of the culture and creativity in cosplay. Cosplay has been a huge part of her life for making new friends and trying new things. The hobby has helped her become more confident in herself and she seeks out others to help them find their inner strengths through crafting. The Pannonator's Pan-Tastic Cosplays (just call her Pannon!) has been cosplaying since 2001. Over the past 17 years, she's refined her craft and competed all over the United States and abroad! Pannon has won over 60 awards nationwide. She and her cosplay-partner, Garnet Runestar won the title of Team USA in 2014 as part of the World Cosplay Summit, and got to represent the US again in June 2017 as Team USA in The Netherlands' C4 competition. Though she still competes in the international circuit, Pannon has also judged for over 30 contests, returning as an Alumni Judge for the World Cosplay Summit, as well as several national cosplay contests. She continues her craft professionally in the field of costuming and fashion. Pannon worked as Lead Designer and Seamstress for a professional sports mascot company, where she built mascots for the Utah Jazz, the Denver Broncos, Chicago Bulls, Charlotte Hornets, and many more. She is currently a designer, seamstress, illustrator, and pattern-maker for a local dress-making company that specializes in fanciful gowns for photographers and fashion shoots and runs her own brand of fashionable bags and accessories on the side. David Jeffress has been an active, enthusiastic nerd for as long as he can actively remember. He fell in love with podcasts as a listener in 2015. Inspired by the myriad of styles he heard, he wanted to create something of his own and thus, August 10th, 2016 Dungeons and Chill was created. David plans to continue his podcasting pursuits so keep an eye out for future projects. When he isn't editing or recording, David is often spending time playing video games, reading comics or watching movies with his cats. Maycey is a freelance music creator and epic mother of three. She loves her children as much as she enjoys creating music and aspires to create epic ballads for video games someday.